US polar orbit Launches are usually from California due to geography. See How does one dogleg from Florida to a sun-synchronous orbit? for more on that. But high energy interplanetary launches usually take advantage of the ~0.4 km/sec delta-v "kick" from the rotation of the Earth by launching Eastward. edit: While I'd originally asked why this launch will use a polar parking orbit, it's clear to me now from answers to Why does InSight plan to launch from Vandenberg that the polar orbit just follows from geography, and that follows from launch site availability and scheduling. The 59 to 66 minutes sounds like a 3/4 turn around the Earth, and then the 2nd burn of the second state will put InSight and its other payloads on a trajectory to Mars. Question: How long will the 2nd burn of the Centaur 2nd stage last? How far from Earth (roughly) will it be when Insight is deployed? And will the Centaur do any further propulsive maneuvering (either main engine, or thrusters) to ensure that it doesn't follow InSight or the other payloads all the way to Mars? The NASA press kit has some information. It shows the 2nd and last Centaur burn from second 4736.9 to 5059.8, so a total of 322.9 seconds. Shortly after the release of InSight, the Centaur will begin an avoidance maneuver taking itself out of the spacecraft's flight path to avoid hitting either the spacecraft or Mars. Shortly after InSight separation, MarCO-A will be released by its CubeSat dispenser, the Centaur will roll 180 degrees, MarCO-B will be released, and then the Centaur will complete its avoidance maneuver. I think that means there are two additional maneuvers after the 2nd Centaur burn, but it's not clear how large those are i.e. thrusters or main engine. They're not so clear about altitude. It does say that "the parking orbit is nearly circular at an altitude of 115 miles (185 kilometers)", so the start of the 2nd burn should be about there. Not sure what the end will be. Not the answer you're looking for? Browse other questions tagged orbital-mechanics launch trajectory deep-space insight or ask your own question. How does a launch vehicle control its trajectory during the first stage? 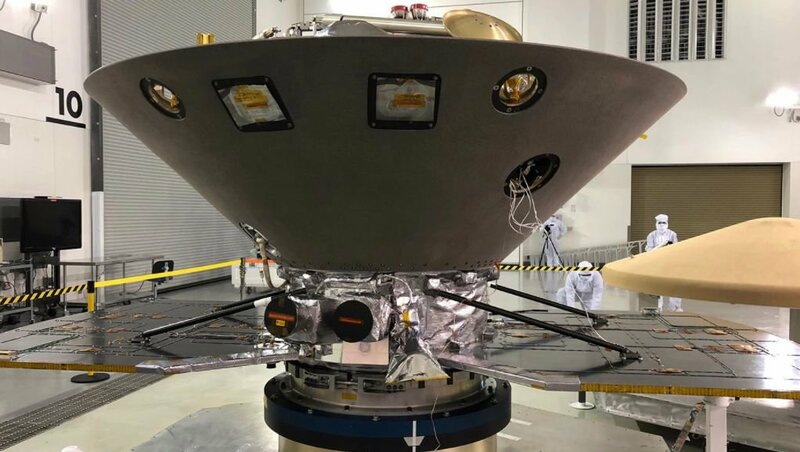 Did InSight take a “mean left” turn on its way to Mars? Is it an out-of-plane maneuver?